I love that the images have a greeting drawn right into the object. And I love, love, love that some of them are puns! That Marcella Hawley is one clever cookie! The sentiments that are included can be used on the inside of the cards, so you've basically got everything you need in one set to create some quick and easy Valentine's Day cards. And that is exactly what I did. This first card features Found You. I love these socks! And the little greeting is so cute, because who among us hasn't had a sock go missing? Sooo very cute. I printed the image onto smooth white card stock and colored it with Faber-Castell Polychromos. The picture doesn't show it but, there's a whole lotta sparkle going on! I used a Clear Wink of Stella and my Clear Star Gelly Roll pen. I dusted a little Broken China Distress ink around the image while it was still in the die. Click on the image to enlarge it. A single tiny shiny heart was the finishing touch on my card. This image could also be for an anniversary. And hey! 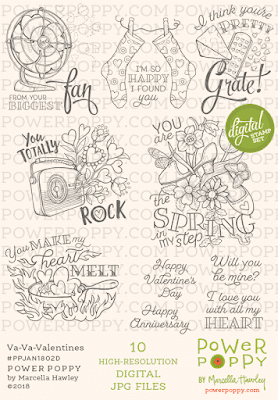 Marcella has included a "Happy Anniversary" sentiment in the set for you! This next card features Pretty Great. Isn't this adorable?! 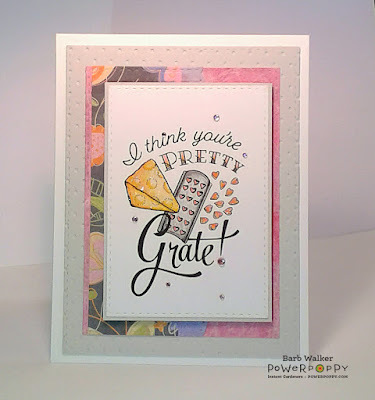 First of all, it's punny and then, LOOK at that grater! It's got heart shaped openings so that's why there are heart shapes flying out of the back. Isn't that clever?! So cute. This one is printed onto smooth white card stock and colored with Polychromos colored pencils, too. Although it's difficult to see it, the little gems are actually pink and the cheese and the hearts are coated with Clear Wink of Stella. Click on the image to enlarge it. Well, that's just the tip of the iceberg. If you buzz on over to the Power Poppy blog, you can see what my team mates have created to share with you. You are in for a TREAT! Thanks for stopping by today! I appreciate it! Awesome! The images you've shared are fabulous. You're right, that Marcella is so clever. Love the hearts on the grate! And the cards you've created from the images are wonderful. I adore the colors. Your coloring is terrific, too. Soft and so pretty with your signature sparkle. Thanks so much for sharing! What a fun Valentines set of digis and I love both of the cards you created! The sock one is extra cute with the love paper behind your main image! Oh, sweet Barb, these are just the sweetest Valentines, and I love each one! 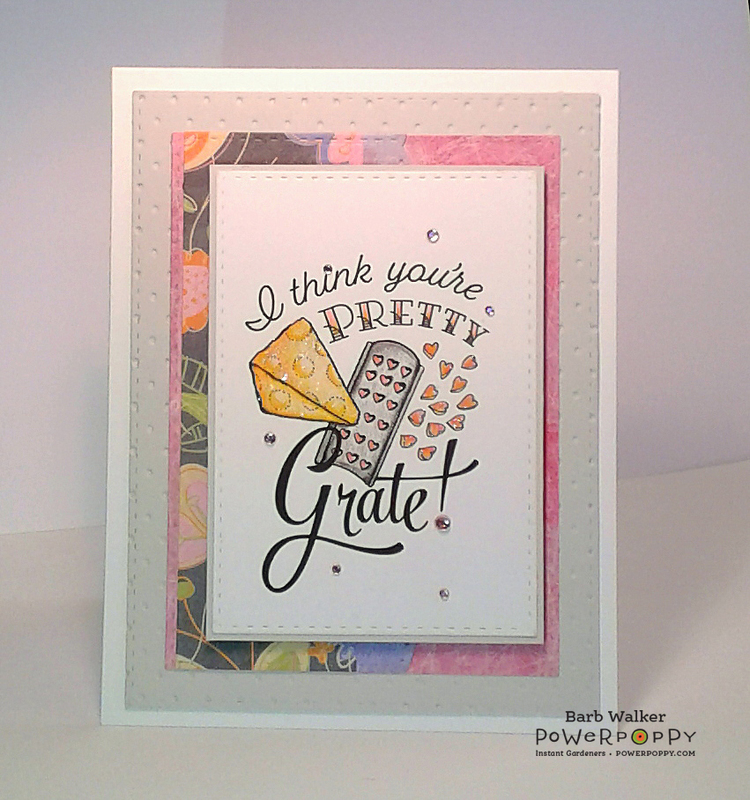 Both of your cards are beautifully colored...just love the layouts and DP! Warm, sunny hugs, sweet friend!